Based on the Free-to-Play Massively-Multiplayer online shooter Hawken, this original graphic novel serves as both a prequel and sourcebook for the game world, offering players a glimpse of what came before the game, and what might come in the months ahead. 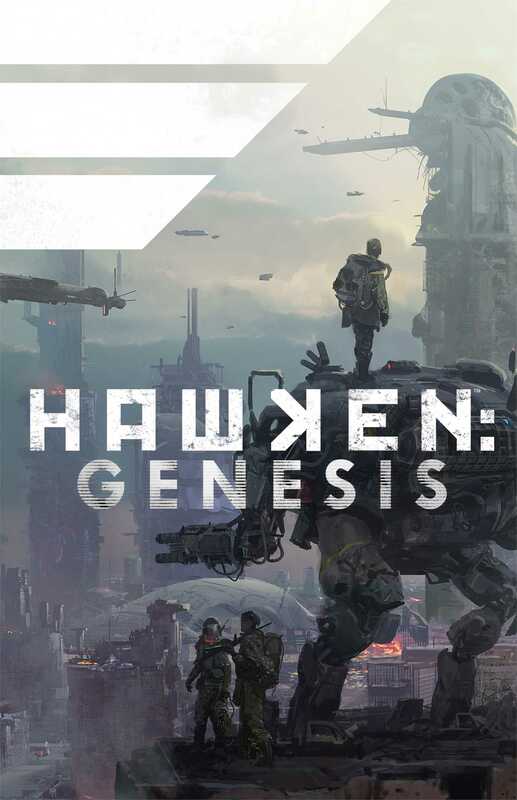 Hawken: Genesis focuses on the relationship between Rion Lazlo, the man who would be king, and James Hawken, the brilliant inventor who paves the way for Lazlo's success. What begins as a mutually beneficial partnership developing magnificent technology for the planet's largest corporation state devolves into betrayal and conflict that soon leads to a man-made cataclysm that changes the face of the planet forever! This lush hardcover graphic novel is written by Jeremy Barlow (Mass Effect, Star Wars) and features artwork by some of the greatest concept artists, comic illustrators, and painters in the industry, including Francisco Velasco (Hellboy 2), Alex Sanchez (Star Wars: The Old Republic), Bill Sienkiewicz (Elektra: Assassin), Bagus Hutomo (Shrapnel), Michael Gaydos (ALIAS, True Blood), Federico Dallocchio (Modern Warfare 2: Ghost), Nathan Fox (DMZ, The Haunt), and Christopher Moeller (Iron Empires, JLA: League of One).